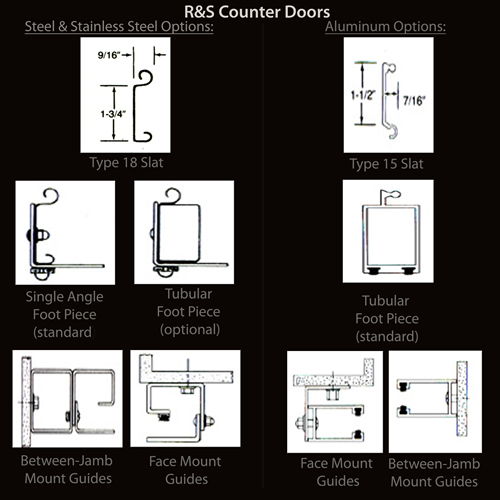 R & S is a leading manufacturer of rolling service doors, counter doors, and aluminum grilles. Our doors are manufactured to meet the need for secure, effective, space saving closures that are endurance tested while providing outstanding economy and value. A variety of mountings, operation methods, materials, and finish options are available. Contact us today to have a free on site evaluation of your service doors. **Note: All items featured may be optional on above door lines and can be changed without notice. Climate-Guard Weather Stripping: Climate control is provided by the combination of a flat slat curtain, hood-baffle, guide weather stripping and astragal. Thermal-Guard Insulation: An effective thermal barrier is created by the combination of 22 gage (min.) 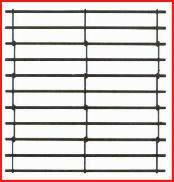 steel flat-faced slats, 3/4″ polyurethane foam, and 24 gage steel back slats. Increased Windload Capacity: Curtain designs to withstand windloads exceeding 20psf. High Cycle Construction: Designs to provide up to 150,000 operating cycles for high use areas. 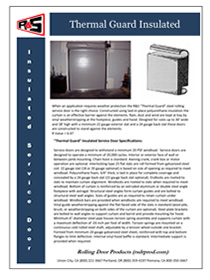 Perforated Slats: 3/64″ diameter holes on 5/64″ staggered centers in type 25 slats provide 30% open area for ventilation and visibility through the curtain. Intermediate Grill: Partial grille curtain connecting type 30 slats above and below for ventilation and visibility. Sloped or Stepped Footpiece: For special sill conditions. Cylinder Locks: On foot piece or guide for extra security. Pass Door: 3′-0″x6′-8″ hollow metal door in a steel frame for access through the curtain when closed; Frame is hinged to guide and swings clear to allow use of entire door opening when curtain is raised; handicap option, custom sizes, windows and special hardware available. Galvanized Finish: On foot piece, guides, brackets and barrel. Powdercoat Finish: On curtain, foot piece and guides. 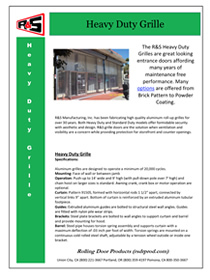 Constructed in the standard straight link pattern for grilles in normal usage such as shopping malls and storefronts. 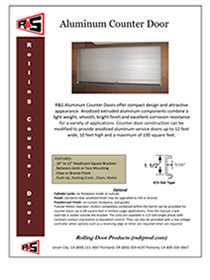 The all aluminum curtain is formed of horizontal rows of 5/16″ aluminum rods spaced 1 1/2″ apart to be connected by vertical 3/4″ aluminum links spaced 9″ apart. 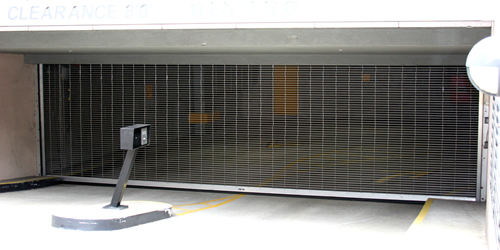 Constructed in the heavy straight link pattern for grilles in high usage applications such as parking garages. Curtain is formed of horizontal rows of 5/16″ aluminum rods alternating with 1/4″ galvanized steel rods covered with a 5/16″ aluminum tube sleeve. Rods are spaced 1 1/2″ apart and connected by vertical 3/4″ aluminum links spaced 9″ apart. A brick pattern is available. High Cycle Construction: Designs to provide up to 150,000 operating cycles. Emergency Egress System: Recessed pull handle in a flush mount enclosure mechanically disconnects motor operator to provide partial opening of grille for emergency exit. Support Tubes: Square steel tubes attached to floor and structure above to provide mounting for grille. Soffit Flange Cover: 5 1/2″ wide flange on bottom of footpiece to conceal slot required for above ceiling installations. Fixed Grille Panel: Grille curtain in a supporting frame. Anodized Finish: Clear, dark bronze, gold, black and other color anodized finishes on curtain, foot piece, guides and hood. 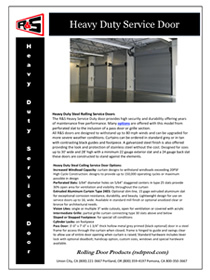 Strength and durability of a rolling service door with compact design and clean appearance. Although primarily used as a closure on counter openings, it may also be used on openings providing walk-thru or drive-thru access. Counter door construction can be modified to provide for stainless steel service doors up to 16′ wide, 10′ high and 144 square feet. Finish – Galvanized steel slats and hoods are pre-finished with a baked on grey polyester primer before forming. Steel foot piece, guides and brackets receive one coat of rust inhibiting grey primer. Exposed stainless steel provided with #4 finish. 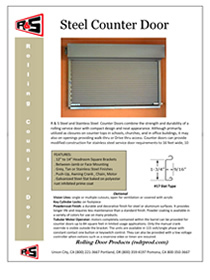 Operation – Push-up to 14′ wide and awning crank on larger sizes is standard (awning crank should be considered when doors are to be operated over a deep counter over 7′ high). Optional chain hoist or motor operator. Offers a compact design and attractive appearance. Anodized extruded aluminum components combine lightweight with a smooth and bright finish and excellent corrosion resistance for a variety of applications. 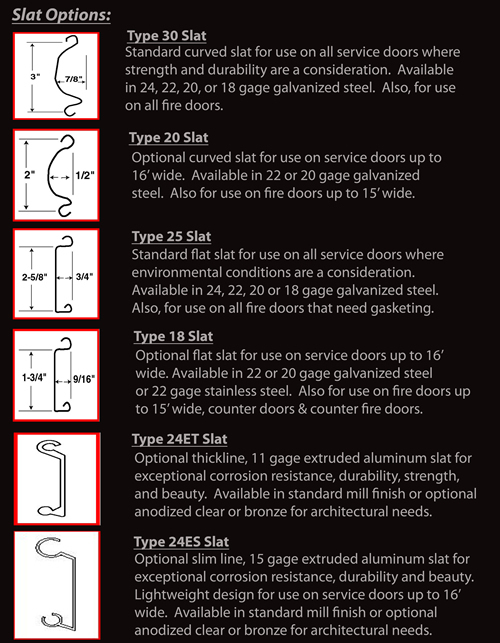 Counter door construction can be modified to provide for anodized aluminum service doors up to 12′ wide, 10′ high and 100 square feet. Aluminum slats, foot piece, guides and hood are clear anodized. Steel brackets receive one coat of rust inhibiting grey primer. Dark bronze and other color anodized finishes are optional. Operation – Push-up is standard and awning crank on larger sizes is standard (awning crank should be considered when doors are to be operated over a deep counter over 7′ high). Optional chain hoist or motor operator.